The park ranger had lost his temper at losing his fiefdom for the day and yelled at everyone coming through the gate, certain no one paid the fee. He also kicked out several volunteers the night before for sleeping on the beach. They left and never came back. Between being shorthanded and having the buoys blown away the night before, the race started late. Several of the competitors in the half ironman distance were still on the course after they’d taken down the aid stations. A friend competed the next year and said that it was much less chaotic so I have higher hopes. They’ve also split the half ironman on its own day so that should keep the numbers down. The course is beautiful. The water is so clear that I could see the tracks of other racers in the sand beneath. The Bear Lake Valley is great place to visit and escape the heat of summer. The course is relatively easy with small hills and a flat run. This is a great race for first timers or those wanting to venture the longer distances. Those uncomfortable with open water may prefer this since the water depth isn’t as deep as a reservoir. Raspberry shakes in town afterward. You will have earned it. 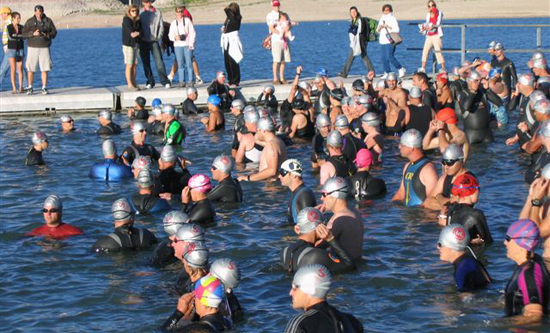 The organizers don’t put on a lot of triathlons so it’s not as well-run as some other races. Bear Lake is a bit of a drive for most so it might be an overnight trip (I personally prefer this). You will be running across the beach to get to the transition area after the swim. Wet sand doesn’t rub off. Bring a small bucket of water or water bottle to douse your feet with. Get there early; the transition area fills up fast. I almost had to set my bike up against a tree.